Minnesota United announced this week that they have mutually parted ways with defender Tyrone Mears. A day after MNUFC announced the termination of Mears’s contract, the 35-year old Englishman signed with West Bromwich Albion F.C. in the English Championship on a short term contract. Three players from Minnesota United received call-ups from their international squads during next week’s FIFA international window. Romario Ibarra will join the Ecuador national team for friendlies against Jamaica and Guatemala. Both games will take place in the U.S. Rasmus Schuller will join the Finland national team overseas for friendlies against Hungary and Estonia. Francisco Calvo will also be traveling abroad, as the Costa Rica national team has friendlies against South Korea and Japan in Asia. Members of the Twin Cities media enjoyed a walk-through of Allianz Field, which is now more than 75 percent complete. Minnesota United received a 2018 Best Award for their booth at the Minnesota State Fair. 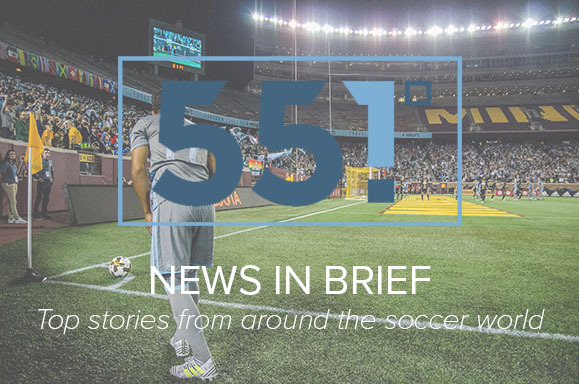 Soccer news across the U.S.
USMNT striker Clint Dempsey announced his retirement this week. Dempsey scored 57 goals in his national team career which, along with Landon Donovan, is tied for the most goals in USMNT history. Dempsey joined Seattle Sounders in 2013 where he won the 2016 MLS Cup. FIFA president Gianni Infantino and U.S. Soccer president Carlos Cordeiro met with US President Donald Trump this week to discuss the 2026 join World Cup bid won by the United States, Canada, and Mexico. At the meeting, Infantino stated he believes the United States has the makeup needed to be one of the top three soccer nations in the world. MLS featured four regular season games midweek this past Wednesday. Philadelphia Union defeated D.C. United at Audi Field 2-0, extending their winning streak to four games. San Jose Earthquakes beat FC Dallas 4-3 in their first home victory in nearly six months. Portland Timbers returned to their winning ways with a 2-0 victory over Toronto F.C. at home. New York Red Bulls won a close game at home 1-0 over Houston Dynamo. Minneapolis City announced new kit partner Stimulus Athletic along with the The Club Shop due to open in South Minneapolis on September 22. Jeff Rueter of The Athletic writes in depth about the variety of obstacles the USL faces as the second-division league continues to grow.